Ian Bell wrote his name in the record books but finished on the losing side as Birmingham Bears fell to a 16 run defeat against the Derbyshire Falcons in a low scoring Vitality Blast game at Derby. Bell passed Jonathan Trott’s total of 1,911 runs to become the Bears highest run scorer in T20 cricket but his 65 from 51 balls on a sluggish pitch was not enough as the visitors came up short chasing 144. Grant Elliott claimed 3 for 16 as the Falcons managed only 143 for 9 with Calum MacLeod top scoring with 39 but Wahab Riaz took 3 for 27 as superb bowling limited the Bears to 127 for 9. Billy Godleman got the Falcons off to a flier by pulling consecutive balls from Ollie Stone for two fours and a six and he swung Chris Woakes for another six as 18 came from the England seamer’s second over. The game was in danger of running away from the Bears but Aaron Thomason made the breakthrough when Godleman chopped on in the fifth over and Anuj Dal was run out first ball when he failed to beat Woakes throw from mid on. Wayne Madsen lifted Jetan Patel over midwicket for six but the experienced spinner and Grant Elliott applied a stranglehold that restricted the Falcons to 21 from five overs. The pressure accounted for Madsen who top edged a pull at Elliott and Calum MacLeod’s attempts to break free only ended in the hands of Thomason at long on. Stone returned to have Matt Critchley caught at mid on to reduce the Falcons to 96 for 5 and Elliott struck again when Alex Hughes skied a drive to long on. The Bears had turned the match round to the extent that only 37 had come from eight overs and after Riaz and Hardus Viljoen fell trying to clear the field, Wilson gave his bowlers something to defend by hitting Thomason for a six and a four in the final over. The slow pitch had confounded several batsmen and Ed Pollock and Adam Hose became the latest victims as top edges off Riaz and Ravi Rampaul left the Bears reeling on 4 for 2. Bell lifted Riaz over third man for six before two runs off Rampaul took him past Trott’s milestone but the Bears were finding it just as difficult to get the ball away and when Sam Hain was caught behind down the leg side off Viljoen in the eighth over, the contest was in the balance. It shifted towards the Falcons in the ninth over when Colin de Grandhomme miscued a pull at Hughes and 49 for 4 at the halfway stage of the Bears innings reflected the quality of the bowling. 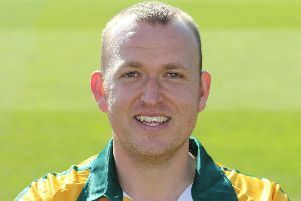 Elliott sliced Viljoen to third man but Bell drove Hughes for six on his way to a 40 ball 50 and two fours from Riaz left the Bears needing 45 from five overs. But after a tight Rampaul over, Bell dragged Hughes to wide long on and after Viljoen conceded just one run from the 18th over, Riaz settled it with two wickets.